Nicaragua was planted with coffee in the late 1800s, but it wasn’t until the middle of the 19th century that the crop established itself as an important export: Increasing global demand—especially from North America—and diminished supply from the Pacific Islands contributed to a steady development of the coffee market here, and the first large plantations emerged in the Managua District around this time, spreading to Jinotepe, Matagalpa, Jinotega, and Nueva Segovia. The Nicaraguan government encouraged European immigrants from Italy and Germany to buy land for coffee, and until land redistribution created small parcels of land (typically smaller than 5 hectares), the majority of the coffee was controlled by white landowners who often exploited local labor with very low wages and poor conditions. While its nearby neighbors of Costa Rica, El Salvador, and even Guatemala began emerging as specialty-coffee origins in the 1980s, Nicaragua’s political and economic instability through the long Nicaraguan Revolution period (roughly 1974–1990), as well as the destruction of Hurricane Mitch in 1998, are among the contributing factors that kept the country out of the specialty spotlight. The breaking up of larger estates into smallholder plots created some confusion and disjointedness among the agrarian sector through the ‘80s and into the early ‘90s; USAID and Fair Trade work in-country was instrumental in unifying small producers into cooperatives and grower societies. 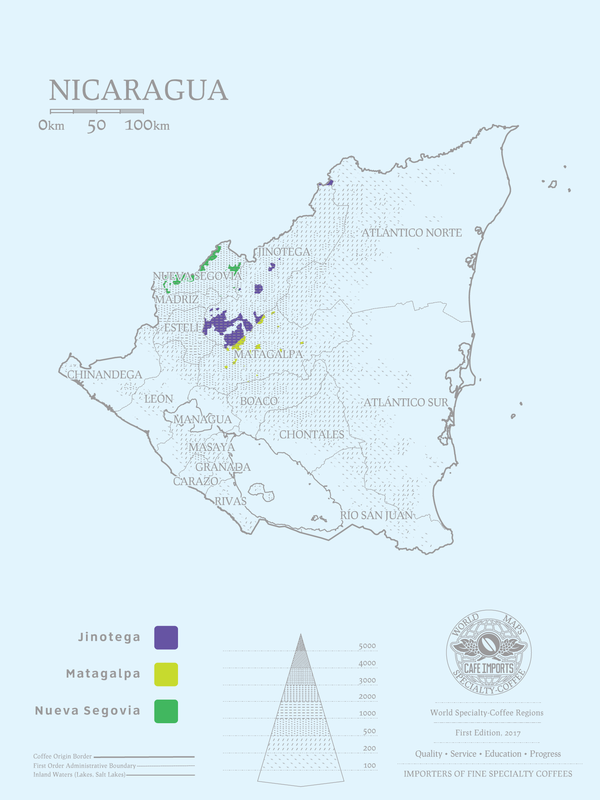 While Nicaragua has historically been planted with good-performing varieties—Typica, Bourbon, Caturra, Maragogype, and other classic cultivars—areas of relatively low altitude (800–900 masl), the remoteness of the small farms, and battles with coffee-leaf rust in the past decade have remained obstacles in the way of the country achieving clear, prized single-origin status. The largest country in Central America, Nicaragua continues to develop its reputation as a coffee origin to watch, however: The crop is still its most important, accounting for over $1.2 billion in exports, and about 15 percent of the country’s labor force is somehow involved in the coffee sector. While Nicaragua has primarily been a source for full-container Fair Trade– and organic-certified coffees for Café Imports, in recent years we have been exploring different partnerships for more specialized coffees from individual producers or groups, and even investigating the possibility of microlots. We see great potential in the Nueva Segovia region, with its higher altitudes and the producers’ growing interest in quality varieties and experimental processing. Europe © 2019 Cafe Imports. All Rights Reserved.